Info "Tilt the plate to rinse off the grime. Don't be such a slob." Clean Your Plate! is one of Young Cricket’s Microgames in WarioWare: Smooth Moves. 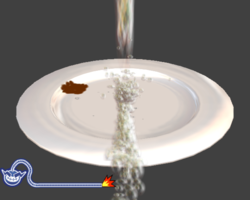 The player has to tilt the plate so that the stream of water touches the grime and washes it away. 1st level difficulty: One spot of dirt to clean. 2nd level difficulty: Two spots of dirt to clean. 3rd level difficulty: Three spots of dirt to clean. This page was last edited on April 18, 2018, at 00:04.